Poor broccoli. It’s such a tender, giving vegetable  all that green and goodness, edible from stalk to top  and it deserves more than most people give it. It’s that time of year, you know. Early January, when people decide to become “more healthy.” Spent and pasty after weeks of baked goods and revelry, some of us join gyms in a frenzy, wake up early to go running in new spandex clothes, and count calories like we’re counting our pennies after all that spending. Along with the push to exercise comes the wish to “eat right.” It’s never entirely clear what that means, because newspaper articles herald a new miracle food every day. If you ask people what they should be eating, however, I’m guessing that most of them would say: broccoli. See what I mean when I write poor broccoli? So many people see it as obligation food, the vegetable we should be eating. How long does any resolution with a should in it last anyway? Broccoli is a celebration in the winter. The skies are bleak and unyielding, the air is chilled against our skin, and there will be no real color until early April. (Oh March, the longest of all months. It’s still two months away.) However, broccoli? It’s vivid green, with little dots of verdant life, a plant determined to grow through cold, dark soil and come up smiling. It tastes so good too. I like to shave raw stalks into salads of lacinato kale and red chard, topping them with goat cheese and sunflower seeds. Who doesn’t love broccoli with cheese sauce? (Well, probably not so much the lactose intolerant, but I know some who worship it from afar.) No stir fry is complete in this house without the bottle of tamari or several heads of fresh broccoli. No one, however, could love broccoli as much as our Little Bean does right now. When we steam the florets in water and a touch of butter until they are bright green and yielding to the teeth, she sits up in her chair and chatters. She eats one little tree after another, smiling. She doesn’t know that broccoli is supposed to be a should. She loves it with buttery fingers and an open mouth. And so, we’d like to hear from you. How do you celebrate broccoli, singing its praises in front of the stove? What are your favorite flavor combinations? What do you think of when you see broccoli? (I have to admit, to my own shame, that I always think of this lame Saturday Night Live sketch from the 1990s, where Dana Carvey played a bad singer whose only song was a drawn-out, unfunny “Chopping Broccoli.” Every time I cook with it, I sing it, unconsciously. Damn it. I’m doing it now. Give us your suggestions. Let’s learn from each other how to make broccoli more than a should. This is a return to a series we did for a few years: the ingredient post. We’ll post up a single ingredient, in season, every other Wednesday. You leave your suggestions and stories, and we’ll learn from each other. The following week, we’ll create a recipe based on the food story that caught us most in the moment of reading. My absolute favorite veggie dish is steamed broccoli with lemon squeezed over it and sprinkled with a bit of kosher salt. It's making my mouth water now! Roasted brocolli. It's like brocolli candy. Use enough olive oil and make sure to rub the tops with it so they get really crispy. Salt, maybe some parmesan, but I don't need it. I can eat a whole head of it this way, just snacking on it like it's popcorn. my husband loves broccoli, but me…not so much. the compromise: broccolini. blanched and then sauteed simply with garlic and drizzled with fresh lemon juice. the winters here KILL me. A few of my past gluten loaded favorites all had broccoli in them. One of them was crescent roll dough layed flat in one giant piece and filled with chicken, broccoli and cheese. The dough is wrapped around it and baked. Ewwy gooy goodness. The other favorite was pretty much the same ingredients sans dough … chicken broccoli cheese. The first time I had that recipe was at Whitespot and then I learned how to make it at home and loved it, with that hint of curry. However, it calls for condensed cream of mushroom and chicken soups, which I have yet to find gluten free versions of here in Canada so I still haven't figured out how to make that dish. It was great on a cold night. Now the only dish that I make regularly (in the summer) is broccoli salad (broccoli, grapes, nuts, bacon and mayo). It's great, but I wish I had more uses for it. i cant get enough broccoli! but my absolute favorite is blanched, then sauteed with garlic, basil, and brown rice penne, topped with shreds of parmesan, soy sauce, and cayenne. my favorite since i was 2. Broccoli is awesome as a base for soup made from oven-roasted red onions, steamed/boiled broccoli (lots), blue cheese (added off heat during the blending process to taste), seasoning and some cream to finish it off. It's mightily decadent – Winter comfort food to the max with no care for calories! On the simpler side, steamed broccoli served with dry pan-roasted almond flakes and a dressing of lemon juice, olive oil, capers, salt and black pepper is simply sublime! (And it tastes lovely served cold too). Broccoli is one of the vegetables that my brother and I have always loved. It always seemed weird to me that broccoli would be something considered weird or yucky. Raw with dressing, steamed with butter, cream of broccoli soup… my grandma used to put it on pizza sometimes. I love Broccoli!! It is my favorite vegetable. I love taking and steaming it until its tender then blending it up with a little olive oil and salt. It has the texture of mashed potatoes, it's delicious. Broccoli slaw is amazing as well. You can make it just like any other homemade cole slaw or instead use a dijon vinegarette. We either slice with a mandolin or buy the broccoli slaw from the store. Delicious and SUPER healthy! Strangely enough, broccoli always makes me think of my big sister. She always loved broccoli and couldn't get enough of it. Maybe that's why she's so skinny! My stepdad made a killer broccoli and cheese casserole when we were little, but now that I try to be healthier, I love broccoli sauteed with tamari, and a little mustard and sriracha sauce. I've never seen broccoli as a "must" – as a kid, it was my favorite vegetable! We only started eating it when I was 8 years old – in the Netherlands, broccoli was first sold in supermarkets in the late 1980s. (maybe earlier in specialised foodstores, but I don't know that). And also a lot in stir fries and pasta sauce. Yay for broccoli! I LOVE broccoli. I can never get enough of it when it's served simply (just steamed) alongside my sunday nut roast, or baked sweet potato. I love it in stir-fries too. I'd like to love it raw but haven't got that far. I also love it steamed and served with a simple marinara sauce. Hubby loves it with shavings of parmesan, and without the marinara. A handful of bashed garlic cloves and a generous measure of olive oil are turned about in a tray of broccoli florets, then thickly dusted with paprika and smattered with dried chili flakes and maldon salt. I roast this mess for about half an hour in a hot (210degC) oven until darkly crisped in places and meltingly tender in others. It's better than kale chips or potato wedges – I've been known to scoff a the whole tray before it hits the table – no mean feat considering two broccoli heads are sacrificed each time! My absolute favourite way to eat broccoli is roasted with olive oil, salt and pepper. Cut into small to medium florets, it gets properly crunchy on the outside with a few blackened bits and is that lovely al dente texture on the inside – a hot oven for 20 minutes is perfect. From there, one of the best ways to combine it into a dish is to have it with pasta and smoked garlic. If you roast the broccoli, lightly fry the garlic in a generous quantity of olive oil and then combine the two before tossing the whole thing with cooked pasta…well. It's just a bit of heaven. That comes together very quickly! Oh my heavens, how I love broccoli. I didn't always–we grew together like good friends. When I was little I refused to eat it without cheese sauce, and I refused to eat the florets–I only liked the stems. I still prefer the stems. Yeah, I know. I'm happy to make a head of broccoli this way and just make a meal of it. I remember The Enchanted Broccoli Forest as one of the great cookbooks of the seventies. In fact, I made broccoli last night. Rice pasta with sauteed ground beef, broccoli, chick peas, canned stewed tomatoes, truffle oil and garlic. I also get the kids to eat it by sauteeing and adding parmesan. Broccoli always goes into stir fries, into pasta salads, and under cheese sauces for me as well. But I'm warming up to just eating it raw, in salads, with some reduced balsamic drizzled over the whole shebang. Oh, and roasted too. The florets get crispy, the stalks get tender, and they're pop-able with a little sprinkling of salt! Not a fan myself but Tina loves Broccoli. I will eat it roasted, tossed with olive oil, lots of garlic and finished with some lemon zest and a good squeeze of lemon. Otherwise, no thanks. Now if you asked me about Rapini, well I could go on and on about how much I can eat in a day. I love the idea for an 'ingredient post!' The key to good broccoli dishes is buying quality, fresh broccoli. I like blanching it first (keeps the good color and doesn't turn to mush). Heat olive oil in a skillet on medium heat, add chopped garlic for a few minutes. Then add the broccoli the skillet to brown. Add some toasted pine nuts, salt and pepper. Delicious and so simple. Sometimes I'll add balsamic vinegar if I want a little more flavor. Let's hope she never changes her opinion! Contrary to popular opinion, broccoli is my families favorite vegetable – straight up and steamed w/ a little salt & pepper. this time of year I just crave greens! It's got to be the dark and the cold- I can't get enough of them. My fave way to eat that wonderful green veg is steamed (with chard or kale or green beans from my summer garden, or just on it's own!!) with a dab of olive oil, a splash of white wine and a few cloves of smushed up garlic. it must be warm but still crunchy- no squishy veggies for me! I couldn't agree with you more – broccoli is one of my favorites! I love it roasted, either on its own or with some cauliflower (another under-appreciated vegetable in my opinion), a bit of olive oil, salt & pepper, and maybe a squeeze of lemon juice. I think I could eat it every day and never tire! I also love it steamed and served with a little bit of butter. And it's perfect with pasta! One of my favorite recipes is here: http://www.101cookbooks.com/archives/000146.html. I love oven roasted broccoli. I recently found that I can get a similar flavor from pan roasting frozen broccoli florets (always on hand around here). Dump as much as you think you will eat in the pan then add a little more. drizzle with a little olive oil and cover. Check after a bit, when the ice has melted and the florets are bright green sprinkle with salt and black pepper and toss. let sit again until side touching the pan is browned (repeat this 2-4 times) eat the whole thing and forget to share with the rest of the house. I have also been eating steamed broccoli with pasta (add a pat of butter or olive oil and a good handful of grated Parmesan and dust with black pepper) tastes like alfredo without the gloppy sauce. My DD loves it plain and simple just like your littke bean. N ot the absolute healthiet, but I have started roasting it. I use a little EVOO and some seasoning, mix it up and throwe it in the oven at 350 for ~30 minutes. It's delicious! BTW…now that SNL skit is stuck in my head too! broccoli and cauliflower roasted with olive oil and sea salt. i especially love the burnt pieces. why do those carcinogens taste so good to me? also, since we live in cold wyoming now, i do a lot of broccoli/brown rice casseroles. i am sure they aren't on the new years resolutions lists of "shoulds" but when it is -20 nothing beats the sound of a creamy casserole. i was a youngster when bush sr. was in office and i remember asking my mom how someone could be the president if they didn't like broccoli. if only politics were so simple to me now. This is weird, but true. In high school, my nickname was Broccoli – somehow attached to me from that Dana Carvey sketch, and I still don't remember quite how it happened, though I know it came from Yearbook class…and I still have a framed watercolor of broccoli given to me by another student, which hangs by our front door. And I was never a particularly ardent fan of the actual vegetable. Lately, we've been using Cook's Illustrated's method of cooking broccoli – pan sear the florets for 2 min in your favorite oil, add 1/4 cup of water with a pinch or two of salt dissolved in it, then cover and steam for 2 min, then uncover, stir and add whatever flavorings we're using that night – garlic, red chile flakes, tamari, ginger – whatever we feel like. Yum. Wow! First comment. We love broccoli in our house. We eat it raw or lightly steamed with a dip of mayo and curry powder. We peel the stems and eat it in stir-fries, steamed, sauteed with garlic and ginger, oven roasted, you name it. Hail to broccoli! This is what I most frequently do with broccoli. I also use an excessive amount in stir fry and throw it on top of brown rice or roasted potatoes with a little grated parmesan. I eat a lot of broccoli, although I have to admit I use more frozen than fresh, especially at this time of year. We recently discovered the joys of simply roasted broccoli – salt, pepper, oil. Even my avowed broccophobe fiance agreed that it made a tasty snack. We both ended up eating most of it like popcorn instead of saving it for its intended spot on the dinner plate. Even served it as a party appetizer! broccoli…my fave of late is to steam it and put a little olive oil on it and sprinkle it with sea salt and ground black pepper. yum! I love broccoli roasted, and then tossed with chickpeas, pine nuts and roasted red peppers. I love broccoli blue cheese soup. I love broccoli, chicken strips and pasta all baked under a blanket of mustardy cheese sauce. I love broccoli parmesan soufflé! I just got home after a trip and my fridge is empty. Maybe it's time for a trip to the market for broccoli. Broccoli with garlic sauce, as made in New York's Szechuan restaurants. So good, seemingly so simple, yet I have been unable to find a recipe on the web. When we lived in NYC we ate it often, but now that we are in Santa Barbara, the lack of decent Chinese food makes it a lovely dream. i love broccoli and my husband hates it. so i make it too rarely. i either roast it in the oven, with olive oil salt and pepper. or i blanch it for a minute and saute it in loive oil, salt and pepper. lemon juice and lemon zest is always yummy on it too but i always think you shouldn't mess with it too much. Our son called them "little trees" too and loved them. He's 20 now and he still loves his veggies, especially broccoli! Enjoy this time, it goes so quickly! I bucked the trend of children in my acquaintance and began a deep love of broccoli early on. They look like little trees. How can you not love something that looks like little trees? Mmmmm . . . broccoli. Love, love, love it! I was like Little Bean as a child – I've always adored it. Broccoli Cheese soup, just cut up and pop it in mouth, steamed with butter and sea salt…oh I could go on and on! We just made a pasta dish last week with sausage and broccoli, which we loved. It was so simple, but amazingly good. Lately I've been craving the childhood comfort food. My irish mom was not know for her cooking but she did make a mean broccoli-rice casserole (frozen broccoli, white rice and swiss-yum) and baked potatoes topped with all the fixins, including broccoli. I've made both of these (with some modification) in the past month. oh the joy…. Count me among the broccoli lovers too! Steamed is how I eat it most often but I love it in stir frys and salads too. My sister makes a wonderful broccoli soup which I adore as well. The way we most often enjoy broccoli is simply steamed, just enough to take the hard crunch out of it, and dressed with a bit of kosher salt. That's it. If it's overcooked, starting to brown, or mushy, I'm not interested. But steamed to perfection? We LOVE it. It's a regular in our household. YEA Broccoli!!! How do I love thee, let me count the ways. . .Hands down it's my favorite vegetable, brussle sprouts a close second. I too didn't know that I was supposed to not like vegetables as a child. Though over all I'm still not a fan of the carrot. I'm slightly anemic so when I think of broccoli I think of all that lovely iron that I get to eat and how much better it will make me feel. I love broccoli slaw. I just made a bowl of it today and it is resting in the fridge (it's best the day after, because of the raw red onions in it). Raw chopped broccoli (including the peeled stems), a mayo dressing with vinegar, sugar and salt, and onion and dried cranberries. I crave it. My oldest started eating broccoli as a toddler when I told him they were trees and "only the biggest, strongest dinosaurs can eat trees!" My second child needed no such encouragement, he's liked broccoli since day one, just like your Little Bean. I LOVE THAT SONG! choppin' broccoleeeee, choppin' broccoliiiiiiiiiiiiii… oh and i love the vegetable too. There is also something to simply roasted broccoli with a little bit of olive oil, salt and pepper. Broccoli is a staple vegetable at our house. 4 out of 5 love it. We prepare it many ways but I like the suggestions from the other posts and will have to try some of them! This is an amazing recipe from The Wednesday Chef using broccoli. It's roasted with cumin and coriander. It's sosimple, but so delicious! Family favourite: Lightly cooked broccoli and cauliflower, mixed with tuna (tinned), smothered in cheese sauce and sprinkled with sesame seeds, then baked until lightly crisped under a grill. Yum yum. I have always loved broccoli steamed just until it's tender and then lightly seasoned with lemon juice and a little butter. Yum. Cream of broccoli soup is also a favorite at our house though we use 2% milk instead of cream, for health reasons. Is broccoli really in season now, though? Maybe in some parts of the country but not where it's freezing cold. Scroll down this blog post for another use for brocolli! I love broccoli and eat it all the time, as do both of my kids…..and spinach too – yum! Yep, "princess leia" does look cute, even if she's a little green. Love broccoli sauteed with shallots and tomatoes. Roasted, hands down. Like Heidi said. The only time I liked broccoli as a kid was in a green giant frozen meal that consisted of cheese, pasta, and broccoli. My mom would add some chicken breast and it was one of my favorites! While I just discovered last year the wonders of roasted broccoli over steamed, lifeless broccoli, I remembered recently the frozen meal of my youth and wondered how I could make it myself this time around. Guess what we're having next week for dinner? Cheesy chicken and broccoli pasta comin' up! Both of my favorite ways to eat Broccoli are thankfully gluten free. First, a meal I learned from some of my vegan friends…Steamed Broccoli with tofu cheese sauce over brown rice. The tofu cheese sauce I make isn't really like cheese, it's not dissimilar to hummus as it involves, tahini, garlic and lemon juice a splash of Braggs, a little nutritional yeast. It's really delicious and super comfort foodie while still being healthy. It's good with other veggies but I have to say Broccoli is my favorite pairing. Also, I thought my wife was a "effing" genius when she made me a Broccoli salad from the Greens cookbook (I didn't know that she used a recipe- at the time). It includes lightly steamed broccoli, roasted peppers, olives and capers in a vinegrette. Super amazing! I amazed at all the new possibilities your blog has offered me and I thank you! As Dana said above, Black Bottle in Belltown makes what they call "broccoli blasted" that is just absolutely fantastic. My best imitation is to cut broccoli into small pieces, toss generously with olive oil, fine bread crumbs, salt, pepper, and maybe some parmesan cheese. Roast in a single layer at the highest heat your oven will go until the edges begin to blacken. Reminds me a bit of popcorn, with its addictive saltiness and slight crunch. I've been known to burn my mouth trying to eat this straight out of the pan–it's just too good! Love broccoli! Unfortunately, having a thyroid condition and being on medication I'm supposed to avoid cruciferous veggies. Counts out many of my faves – broccoli, cauliflower, cabbage, brussels sprouts. Boo. I cheat on that rule occasionally. Broccoli's my kids' favorite veggie. When it appears on their dinner plates they cheer for it ("ooh! broccoli!") even before commenting on whatever the main dish might be. I love it! I'm with Little Bean — give me my broc straight up, lightly steamed, with a dash of kosher salt. Butter-type substance is optional. My favorite way is the next day, having almost always steamed/boiled five or six heads, half destined for leftover status. Simmered to steamy warmth in a few cups of good broth, then pureed with a heap of extra sharp cheddar, a healthy spoonful of mustard, a good grinding of nutmeg, a touch of salt and lemon, and a giant smile. Dinner in a steaming hot bowl, salty sweet, fragrant, SO good. And ten minutes, start to finish. Broccoli is a favorite around our house. It's quick, simple and probably my kids' (4 and 2) favorite. Just simply steamed is our favorite but a quick stir fry with teriyaki or a large, steaming bowl of Cheddar Broccoli soup is divine. The kids call them trees and ironically, only like the tops so once they bite the heads off, they chuck the stems across the table at us. I'm chopping brocc-i-lie!!!! I'm guilty of singing that song too at any mention of broccoli. My new favorite broccoli dish is Broccoli in sesame garlic sauce by 'I am Gluten Free'. Full of flavor & ka-pow! Brocolli is my family's favourite vegetable. It's full of healthy, wholesome goodness. I love it plain stir fried, sprinkled with some sea salt and a lot of freshly fried garlic…yum. I love broccoli… i just steam it and pour over my homemade teriyaki sauce and sprinkle toasted sesame seeds on top! yum! I love Broccolini sauteed with garlic, olive oil, salt & pepper. I could eat it every day! Oh how I love broccoli. I love it roasted, sauteed in olive oil and garlic, steamed and topped with some butter, salt and pepper, pan fried, raw with a drizzle of olive oil and balsamic vinegar, blanched and made into broccoli salad, I will devour it any way it is cooked. I adore broccoli with browned butter and mizithra cheese. So good. I might have stolen the idea from a chain type restaurant but I don't care. Its delicious. I like broccoli even though a conference center once served me completely plain broccoli and millet for 5 out of 7 meals, including breakfast. I guess they couldn't figure out what to feed a gluten- dairy- and egg-free girl. Now I mostly eat it steamed with a drizzle of olive oil, garlic and sea salt. Almost an afterthought but delicious. But if we were talking about broccoli rabe… now THAT I really love. I love broccoli in all its forms, from the tacky frozen kind (which I admit to have eaten in its frozen form) to fresh from the garden. I eat it raw, which despite leaving green stuff inevitably in my teeth is delicious. I especially love creamy broccoli soup made with shallots, white wine and heavy cream. I guess that preparation negates some of broccoli's healthiness, but with a nice sprinkling of fresh cracked pepper on top it can't be beat on a cool winter night in the mountains. My sister-in-law made this for me years ago and I've adapted to be gluten-free and a bit healthier than the original version with heavy cream. 1. Combine milk, cumin, chili powder and stock in a sauce pan. Bring to a boil. Reduce heat and simmer until reduced by half. 2. Blanch broccoli in salted water for 1 minute. 3. Mix broccoli with ricotta, cumin, garlic and 1/2 of both cheeses. 4. Heat tortillas in a lightly oiled pan on both sides. Remove and coat each side with sauce (above) and layer 4 tortillas and top with broccoli mixture and 4 more tortillas. 5. Pour stock over enchiladas and top with remaining cheeses. 6. Bake at 350 degrees for 30 minuites. Serve topped with cilantro and tomatoes. We eat steamed, but still crisp, brocolli with fondue, and potatoes, and apples, and of course bread. Yum. We usually just steam broccoli and eat it plain or with a bit of lemon butter on top, but my absolute favorite way to eat it is tossed with spicy peanut sauce. I can go through an embarrassing quantity of it this way, preferably mixed with some pan-seared tofu cubes. Maybe this sounds a weird and too church-salady, but there's a really awesome dish you make with red onion, bacon, raisins, sunflower seeds, broccoli, and some kind of dressing to bind it all together. It is honestly very good. We eat broccoli at least once a week, usually steamed — my wife drizzles hers with Bragg's Liquid Amino, and me? I prefer mine with ume plum vinegar. It's the perfect combination of salty and tangy, without hiding the broccoli completely. Am I the only person who thinks of James Bond? Produced by Albert R. Broccoli… Sure broccoli looks like trees, but for me, it always triggers the titles for Bond films with the big Broccoli name plastered across the screen. Albert's father invented the vegetable some of us love and some hate by crossing cauliflower with a pea. I kid you not. I love broccoli. I used to stir fry it with oyster sauce, but now I'm smitten with a raw Southern salad: Broccoli, Bacon and Raisin salad. It is a classic, and it is the only way I can get Booth to eat the stems. Usually he just eats the florets. If you want the salad recipe, say the word. I also make a killer broccoli soup. That uses the stems, too, but Booth doesn't know because they get pureed at the end. okay, so the way i was raised to eat broccoli was not high class, but it worked. sometimes i eat it plain, but i prefer to eat like i did as a kid-dipped in a mustard/mayo sauce. start with 1/4 cup low fat mayo (i use dukes mayo here in NC) and add mustard to taste. the more mustard the better. my husband will actually eat it like this. I can't get enough of roasted broccoli (just with olive oil, kosher salt and black pepper). It's easy, fast and oh my god so good. I also love steamed broccoli with butter lemon sauce… or lemon garlic aioli… it's disgustingly delicious. Roasted with split grape tomatoes, lots of garlic and olive oil, salt, pepper, and red pepper flakes. Roast until tomatoes burst, and broccoli is nutty. Deglaze roasting pan with just a smidge of chicken broth, then serve over the pasta of your choice, topped with parmesan. I make this for a friend with celiac, and it is lovely over thai rice noodles, as well as regular pastas. Ah, broccoli. Every time I eat a floret of broccoli I still imagine it as a tiny little tree (although, the one in the picture really does look like princess Leia). I'm guilty of using frozen broccoli, but a decent brand at least. Nothing better than a big bowl of steamed broccoli with a little butter and Mrs. Dash "table blend" seasoning. Seriously good, and can be done in the microwave. Oh raw broccoli in ranch… I accidentally finished a whole (small) bottle of ranch off like that one time. Not a good day. And yet, still more magically delicious than lucky charms! I'm with Rosie on the roasted broccoli, but I also love a creamy broccoli soup. I used to make an excellent, simple one with plain soy milk, actually, when I was a vegetarian. I adore broccoli, steamed with a bit of butter and salt and peppery yum, also added to a teriyaki chicken stirfry is a family favorite. I like broccoli all ways, esp. roasted, or cooked stovetop at high heat in olive oil, then butter and salt added, six minutes max (covered). recently i discovered a raw broccoli preparation that is very yummy; cut up florets, drizzle over red wine vinegar and salt. Gently heat a decent amount (a lot) of olive oil, add minced garlic and cumin seeds and red pepper flakes. Heat a bit, pour over broccoli, and let sit at least an hour. melissa clark gets credit for this one. also brocc with white beans and mandarin segments, in a rosemary mayonnaise dressing. broccoli? A I should food? No way! When we order out chinese i always eat the steamed broccoli first. it always has the perfect steamed but a bit crunchy texture and sooo much flavor!!! Just wish I could make it like that at home. I love it with cheese and as a casserole with rice and cheese. Covered in teriaki with seasme seeds( of course everything tasts good in tariaki. Broccoli soup has always been my comfort food. It just makes the wourld right to sit back with a bowl and savor the flavor. If your lucky yull have chunks of slightly crunchy broccoli to crunch on. Mixed with the rich cream soup. YUM! Growing up, broccoli fell into the same category as cauliflower. It would end up overcooked and mushy. We're talking about apply light pressure with some tongs and you would get mush. It wasn't until we moved to Melbourne and I started to eat good asian stirfries that I discovered the delight of crunchy broccoli. Now I love it steamed and unadorned. Bright green and just tender enough to eat. I've had the girls over for dinner and the broccoli had to be rationed out so that no one got more then someone else, we love it that much. I even volunteer to take it from other peoples plates who don't like it. so many things to do with broccoli & i too, love the enchanted forest! Broccoli with brown butter, almonds, and a splash of lemon. It just doesn't get any better. My little ones loved broccoli at an early age too. My oldest wouldn't eat most things unless you mixed it with broccoli, other than broccoli of course. I was the kid who stood up and cheered when Bush declared the whitehouse a brocolli free zone. Didn't eat it as a teen… and the 20's slid by without a single stalk passing my lips. But, well. I turned 30 this fall, and I don't know if it is a suddenly adult set of tastebuds or what… but I'm knocking back the little trees like its chocolate covered popcorn! Roasted, stirfried, slightly steamed (and snitched out of the pan burning my fingers before consigning the rest to vegetable death for my husband who prefers his veggies thoroughly killed) but even more – raw. Chomped on in simple salads with cashews and carrots, or simply wandering around with a bag of the florets to munch on while running errands. Just… odd. I'm wondering if hitting the 6+ month gluten free is shaking up my tastebuds! I have to admit that I only like like broccoli served one way: this particular broccoli slaw – http://amelieschoice.blogspot.com/search?q=broccoli. Mmm, this post just caused a shift to this weeks grocery list. My favorite is roasted with a little olive oil, garlic, salt & pepper. Close second, is pureed to a soup with leeks, garlic, cayenne and good chicken stock. I used to like the tree part of the broccoli best, but then I got a-hold of some fresh stuff and trimmed the tough skin off the stalk — and inside was some of the tenderest, sweetest, nicely crunchy broccoli flavor. Cooking it is great, but that part, I just like it fresh inside a cold vegetable salad. I used to like the florets best, but then I discovered, underneath that tough skin on the stalk, the tenderest, lightly sweet, just-crunchy-enough broccoli flavor. I like that part best, straight or in a cold vegetable salad. Yum! I love broccoli with eggs. I steam some broccoli, fry up some onions, add the broccoli to the onions, add some prosciutto and freshly grated Parmesan cheese and a beaten egg or a few (depending on how I want the proportion of veggies to eggs) then wait until the egg is cooked. Top with sea salt and pepper – voila! So satisfying any time of the day. Sometimes I add almond meal for a thicker texture. I think the less you do to broccoli, the better it tastes! My favorite way to eat it (note: not the healthiest way…) is to boil and strain it, then top it with browned butter and freshly grated Mizithra cheese. 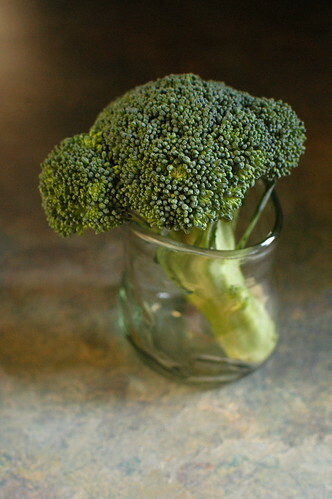 The Mizithra has a buttery, nutty taste that complements the broccoli perfectly, yum! My favorite way to eat broccoli is to dip the florets in egg, coat in breadcrumbs, and shallow-fry until browned and crispy on all sides. Sometimes I steam the broccoli before frying, other times I don't. I also recently attempted an improvised version of broccoli in a Chinese-style garlic sauce and it turned out great! My husband was initially disappointed when he asked me what we were having for dinner and I told him it was broccoli over rice. "Just broccoli?" he asked in an incredulous tone. He ended up going back to the kitchen for seconds (maybe even thirds). Growing up, I must have eaten steamed broc w/melted velveeta every night for dinner. Now that I have a more sophisticated palate, I enjoy roasted broccoli. Cut the head into florets, toss with olive oil, S&P. roast until the florets get toasty brown. Squirt of lemon juice and it is heaven in your mouth! Broccoli is Rememberance for me! When we were at university (04-06) broccoli was always one of the cheapest vegetables here in New Zealand, so we had it all the time. I finally started liking it on a roadtrip when I found to my horror my flatmate had brought an entire head of broccoli as 'snack food'. Good heavens…… it looked horrendous, but it was SO GOOD. I love broccoli now. We cook it often in my flat. Nothing like broccoli picked fresh and plonked right in a pot of boiling salted water (helps get rid of the stray aphids!). Another favourite is broccoli soup – very simply broccoli, milk, ground almonds, salt and pepper. Use an emmersion blender. we all know broccoli and lemon go well together, but you simply MUST try broccoli with grapefruit. just prepare broccoli you're favorite way — steamed, roasted, sauteed — and squirt with fresh grapefruit juice. my favorite preparation is to sauté some steamed broccoli florets with a bit of olive oil, garlic, sea salt, pepper, and grapefruit juice. divine. I always think of my kids when I think of broccoli. Like the time when I was in grad school and NECI catered our meals and the chef took pity on my then 5-year-old boy who had absolutely no interest in trying anything they had to offer in the cafeteria. When he asked my boy what he wanted, he said "just broccoli." So that's what he got, a huge steaming plateful all to himself. My kids will fight over the last piece of broccoli! And whenever I make a mac and cheese casserole, we must have steamed broccoli on the side because there is no other vegetable that accompanies that comfort food so well. Steamed until it is a vibrant green, broccoli is our little family's perfect food! Broccoli with rice noodles and homemade peanut sauce! I love how the florets soak up all that creamy sauce, and I adore the springy crunch of the lightly steamed stalks under my teeth. These qualities make broccoli one of my very favorite vegetables. My kids love broccoli (GF) pasta sauce made by whizzing steamed broccoli with pesto sauce, extra basil, parmesan and olive oil (thinned with cooking water if necessary), then stirred through the cooked pasta and sprinkled with crispy bacon and toasted pine nuts. BTW, cooking brassica vegetables inactivates the goitrogens which cause problems for people with low thyroid function. The only way I like broccoli is when it's roasted with olive oil & salt & pepper. I'm excited to try roasted with grapefruit juice squeezed atop, what a celebration for this veg. You feel the goodness infiltrating your body as you ingest it. Gotta love broccoli with soy sauce, as long as you can find a gluten free version. Otherwise, I love steamed broccoli with basil-infused olive oil, Parmesan cheese, and freshly ground pepper and salt. Perfect side dish with your favorite gluten-free pasta! Unfortunately little smiley doesn't like to eat trees. My favorite ways to eat broccoli are: lightly cooked with homemade GF mac and cheese, in crust-less quiche AKA egg pie, dumped into the pasta cooking water for the last minute of cooking then served with the sauce and cheese. Broccoli Salad. (Don't think Lettuce and ranch dressing, think bacon, mayo, nuts, etc mixed with raw broccoli) It's a traditional part of any holiday spread for my family. Here's the recipe my family uses. Combine broccoli, onion, raisins, sunflower seeds, and bacon. Mix mayonnaise, sugar, and vinegar, and stir into broccoli mixture. I usually add a little more than 4 cups broccoli myself, as the sauce seems overpowering otherwise. Seem most people like to just steam their broccoli with only a touch of salt or other seasoning added after it's cooked. Well, I echo that. After the broccoli salad it's my favorite way to eat it. Plain and simple. Like your daughter, my kids don't think of vegetables as "should" foods. I don't claim any credit, that's what having a community garden available will do. I love broccoli that is cooked simply (steamed or roasted) and then served with plump grapefruit and orange segments. I usually sprinkle it with toasted pine nuts or almonds and then drizzle some lemon-infused olive oil on top. YUMMM!!! I just love broccoli. I start with two organic scrambled eggs & broccoli thrown right into the mix in the AM, I often have it for dinner too. I just like it steamed with butter and lemon. Nothing like having it with an organic baked chicken and rice. Especially when I don't feel good. It's a comfort food for me. Even though the Italians brought it to France in the 16th century, I did not remember eating that much broccoli in France while growing up. Jefferson is said to have planted some in his house in Virginia in the 18th… but somehow, it has become THE vegetable of choice among American families. I have come to really like it in the US where it is mostly eaten al dente. My children love it… and I cook it mostly as a side dish (steamed with lemon) or in pasta (esp. buckwheat). I love your site. I love your words. When my son was very little he lived on Rice Crispies, bananas, apple juice and air. He would eat broccoli too, as long as he could dip it in ketchup. I thought that was okay (this was long before lycopene was a hot topic) as long as he ate it. He has grown into a 6 ft. 4 inch lovely 24 year old and still loves his broccoli, but now with garlic and balsamic vinegar instead. I hope Little Bean has a long affair with this gift from the soil too. Thank you for your site, I'm newly diagnosed gluten intolerant. I confess I think broccoli gets bitter within a day of cooking so it's not my favorite. Anyone know how to prevent it from getting bitter? My favorite recipe is from one of the Moosewood cookbooks, and it's broccoli in a peanut butter tofu sauce over brown rice. Delish! I love your idea of shaved raw stalks (in a salad). I never thought about that. I dislike raw broccoli but the stalk is sweeter and I can see how this might work for me. As for butter, it never hurts to add to any dish, right?! I'm pretty uncreative when it comes to broccoli. Nothing seem to really work. I tried raisins, nuts… it's not IT. The only 2 things that I like are 1) butter, a splash of lemon juice and zest, and toasted pine nuts with steamed broccoli, and 2) a crustless quiche with lemony cream and deal sauce! Now, that one is the best recipes of them all! Both of my girls are huge broccoli fans and they are used to eating it simply steamed or roasted with garlic, olive oil, salt and pepper. While I know many people use dreams of trees and yes, science fiction princesses, I'm so happy they enjoy them knowing what they are also really eating. Mmm. Broccoli, steamed with a generous squeeze of lemon, maybe a bit of sea salt sprinkled over. Nothing more needed! I love steamed broccoli drizzled with a tarragon sauce…a little bit of mayo, tarragon, and some of the water from the pan. Simple and delicious! I like to make a Broccoli Orange Salad with of course broccoli, oranges, kalamata olives, and olive oil. I have the recipe on my blog with a variation using broccoli, apples and artichoke hearts. I continue to learn many wonderful things reading your blog. Keep up the good! -CatKnitz. I like broccoli as much as any other vegetable, but it ain't my favorite. Usuually just steam it lightly, but I shall have to try roasting it having read other people's enthusiastic responses! I like it best in peanut sauce stir fries, in cheese sauce, or raw and dipped in a mix of cream cheese and creamed horseraddish – though almost any vegetable tastes good this way. Broccoli. Love it. Beyond the fact of the nutrient contents, the minerals, vitamins, lipids, amino acids–it just tastes so good. I like it best slightly steamed, then sauteed in olive oil, garlic, splash of lemon, a little s & p. Big Yum. I've always adored broccoli. I never understood why anyone would dislike it, at least as a little kid =D. Yum! Oh lord, I have that Dana Carvey Robt Plant voice in my head too. My children like broccoli and for a while it was their only green veggie. They like it just steamed. I like the stem slices which is good because they won't eat those. I also like warm broccoli with balsamic vinaigrette and salt and pepper. Stir fried broccoli with chicken and garlic and ginger…yum. I have always loved broccoli and my son has loved it since his first bite as a baby. The way we eat it most often is steamed and then sprinkled with Parmesan. Roasted is good and I also have a fabulous broccoli and rice casserole (a lightened version) that is so good I could eat it every day (and it's gluten free!). So I mostly only like broccoli when it doesn't look like broccoli. I cook brown onions (red if possible)and then boil them in water with potatoes and broccolli and garlic. T add salt and maybe sage or curry powder. I puree it all and add milk or cream for a great soup. Molly at Orangette has a wonderful recipe for roasted broccoli with shrimp. But shrimp can be expensive so I frequently make the broccoli by itself and eat it over rice. It's 4 heads of broccoli chopped and tossed with olive oil, black pepper, chili flake, cumin, coriander, and salt. You throw the mess onto a baking pan and into a 400 degree oven for 10 minutes. Stir the broccoli after the 10 minute mark and put it back in the oven for an extra 10. Serve with a squeeze of lemon juice and steamed rice. It's so ridiculously good. I want some now. When I lived in Italy my absolute favourite pasta dish was 'orechiette ai broccoli', which basically consists of sauteed broccoli, with olive oil, dried red chillies and sometimes some thinly sliced garlic, all tossed up with the lovely thumb-dished orechiette. I've yet to find gluten free orechiette, but I live in hope! Wow! So many ways to prepare broccoli! My favorite way is steamed with a little garlic, salt, and then fresh-squeezed lemon juice, but the roasted broccoli is sounding really good to me right now! As a kid I only liked it smothered in cheese, but now its one of my favorite veggies. You know what I hate though, is when restaurants cook it until its a wilted, soggy mess. Way to ruin a great veggie, huh? I make a broccoli sauce and put it over rice or pasta with parm. I chop the broccoli, steam it and then saute it with garlic and olive oil. Then I add the steam water and and cook on low heat until it thickens up. Personally, I think the best way is to bake it. It's good with other vegetables (carrots especially) and some meat or some sort of veggie alternative, but essentially it is god baked. In some oil. So it goes crispy… yum!